Thallus: foliose, forming medium-sized to large rosettes up to 3.5 cm wide or larger colonies, loosely adnate (to semi-erect), lobate lobes: dorsiventral, flattened to convex, 0.3-1.4 mm wide; tips: truncate to rotund, 0.3-0.9 mm wide upper surface: bright orange to orange, smooth to shiny, sorediate soredia: granular, blastidious, in marginal to submarginal or laminal soralia medulla: white, reticulate, with short hyphae lower surface: white, smooth to somewhat wrinkled, with abundant, white to yellow rhizines Apothecia: rare but sometimes abundant, laminal, stipitate, up to 3 mm in diam. 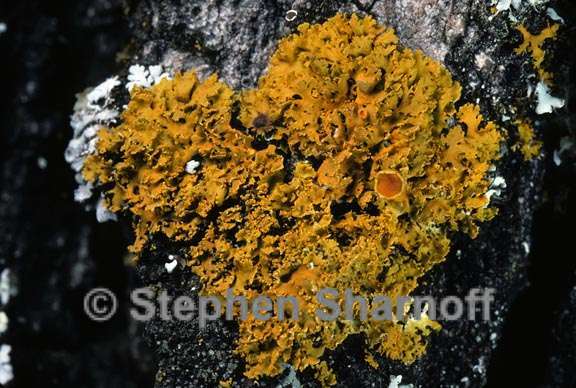 ; margin: smooth but often sorediate, with cilia; disc: orange; epihymenium: brown, c. 10 µm thick hymenium: hyaline below, 20-80 µm tall; paraphyses: simple or slightly branched, cylindrical, septate; hypothecium: hyaline to pale brown, 25-70 µm thick asci: clavate, 8-spored ascospores: ellipsoid, polarilocular, hyaline, 13-16.5 x 6.5-8 µm; septum: 3-5.5 µm wide Pycnidia: common, immersed or slightly protruding, darker than upper surface conidia: bacilliform, 2.5-4 x 1-1.5 µm Spot tests: upper surface K+ purple, C-, KC-, P- Secondary metabolites: parietin (major), fallacinal (major), emodin, teloschistin (major) and parietinic acid. Habitat and ecology: on bark or occasionally rock or detritus, often in humid microclimates World distribution: north temperate regions in America and Europe, Asia Sonoran distribution: scattered in Arizona and coastal, southern California. Notes: Xanthomendoza ulophyllodes may be confused with X. fallax and X. oregana in the region; see notes for those species.